Disney’s food blog at disneyfoodblog.com has confirmed that they will be opening a Star Wars Dinner Club as part of the plans for the new Star Wars Land. Star Wars Land is a new theme park set to be opened inside of Disneyland park at the Disneyland Resort and Disney’s Hollywood Studios at Walt Disney World. This will be an expansive theme park spanning over 14 acres. While the date of when this theme park is set to be opened has yet to be determined, construction began at both locations on April 14, 2016. 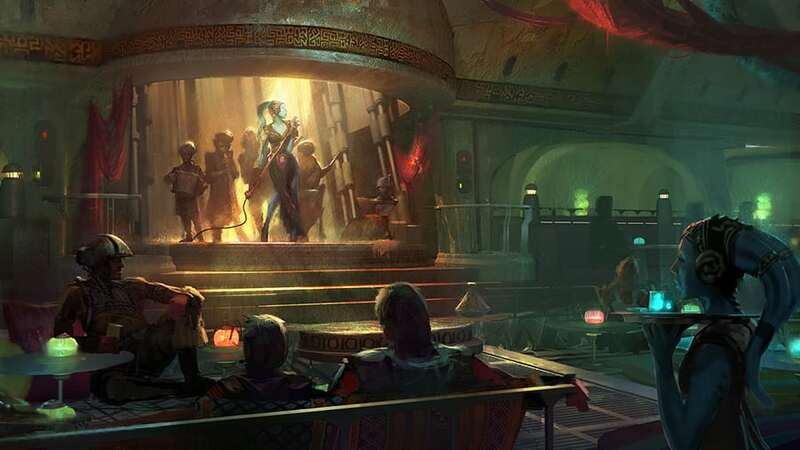 There are still no details as to what this restaurant will serve; however, I’m hoping they have a variety of live music as pictured in the concept art released by Disney below instead of their usual themed music on loop. Previously, Star Wars Land had already announced a Cantina was planned as part of the new Star Wars Land project; however, this solidification of the food news is enticing to Star Wars fans and foodies alike. What do you think? Does this make you even more excited for Disney’s Star Wars Land theme park? Check out these additional shots of the concept art for Star Wars Land and the themed restaurants on the Disney Food Blog!